“Jordan is a model that works, whether we like it or not,” explains Rami Khouri. He is probably right and this is in the face of the king’s recent dissolution of parliament. Democracy has few real proponents in the Middle East today. Laith Shubeilat, a moderate Islamist, described Jordan as a police state in which no real opposition was permitted. “I am an Islamist, but I have never had a platform relating to religion, only one asking for liberties, democracy,” he said, accusing the West of hypocrisy in backing a “dictatorship”. Shubeilat, jailed several times, said five men had beaten him up in October after he criticised the king’s behaviour. Both Khouri’s and Shubeilat’s conclusions say a lot about the present state of the Middle East. I have added two articles by Patrick Seale below because, paired with Alistair Lyon’s article, they lay bare the state of play in the Levant today. One cannot but agree with Shubeilat’s conclusion about Western hypocrisy. Despite all the Washington institutions that are ostensibly designed to “promote democracy” in the Middle East, Washington has few real proponents for the reason that Khouri expresses. AMMAN – Jordan’s King Abdullah, having dissolved an elected, if unlamented, parliament midway through its term, will probably shy away from genuine political reform, despite promises of a clean vote next time round. The 110-member assembly’s abrupt demise last month drew little outcry, perhaps a reflection of widespread public perceptions of malpractice in the 2007 polls that produced it. The 47-year-old monarch, who came to the throne in 1999, has not explained why he dissolved what most Jordanians viewed as a tame lower house prone to venality and self-interest. However, some economists suggest the assembly was removed to allow the government to push through an austerity budget to curb runaway spending and enact investor-friendly laws by decree. Many advocates of reform expect no drastic change. “In recent years, changes of parliament or cabinet are just part of the entertainment business in Jordan,” said Taher Kanaan, a former deputy prime minister, with a wry shrug. The king has told the government to forge a new electoral law ahead of an election that would be a “model of transparency and justice” — a tacit admission of the frailties of the last one, which returned mostly tribal loyalists and businessmen. Parliament, which rejected a tax reform bill in August and sought higher taxes on banking, mining and telecom sectors, might have obstructed a budget aimed at slashing the deficit to 3.9 percent of gross domestic product in 2010 from 7.3 percent. Jordan’s six million people face a contracting economy after several boom years fuelled by an inflow of foreign investment and money transfers from Jordanians working in the Gulf Arab region. The good times tempted the government to spend freely. “Now they realise they can’t go on this way and that it is destabilising the whole economy,” former finance minister Michel Marto, chairman of the Housing Bank for Trade and Finance, said. Public debt is due to hit a record $14 billion this year, nearing a legal limit of 60 percent of GDP, as recession reduces local revenue and foreign aid. Unemployment is about 13 percent. Still, Marto said, the economy is far healthier than in 1989 when debt reached 180-200 percent of GDP and the dinar crumbled. That crisis sparked riots that prompted the late King Hussein to revive parliament, lifting a state of emergency in place since 1967. Islamists won 34 of the assembly’s 80 seats in the 1989 election, contested in a frenzy of political debate. The introduction in 1993 of a new voting system, combined with carefully tailored electoral districts, ensured they never replicated their success. Representation was tilted towards rural, pro-monarchy tribal constituencies and away from mostly Palestinian-populated cities where Islamist sentiment is strong. That bias has been kept in place, partly for fear of opposition to Jordan’s 1994 peace treaty with Israel and the kingdom’s close alignment with the United States. Islamists won only six seats in the 2007 election, down from 17 in 2003 — a decline that some analysts say reflects a loss of popularity, not just the handicaps of the electoral system. Laith Shubeilat, a moderate Islamist, described Jordan as a police state in which no real opposition was permitted. “I am an Islamist, but I have never had a platform relating to religion, only one asking for liberties, democracy,” he said, accusing the West of hypocrisy in backing a “dictatorship”. Shubeilat, jailed several times, said five men had beaten him up in October after he criticised the king’s behaviour. The government has four months to set fresh elections, but politicians say the constitution allows the king to delay them. Nawaf Tell, a Foreign Ministry official who heads Jordan University’s Center for Strategic Studies, ruled out bold moves toward democracy as long as the Middle East conflict festers. “Institutional political reform cannot be launched in a sustainable, consistent track unless there is real progress on the ground on the Palestinian issue,” he told Reuters. The numerical weight of Palestinians in Jordan and their uncertain future may pose tricky problems, but Arab states have often used the conflict as a pretext to defer political reform. Violence in Lebanon, Iraq and the Palestinian territories makes Jordanians think twice before agitating for change. Many sympathise with anti-Israeli groups such as Hamas and Hezbollah, but al Qaeda suicide bombings of three Amman hotels in 2007 reinforced fears of bloodshed spilling into the kingdom. “Now public opinion appreciates security and does not take it for granted any more,” Tell said. If Jordanians do indeed value stability over democracy, there may be little incentive for King Abdullah to promote wrenching reforms or confront an entrenched establishment wary of modernisation that might upset its patronage networks. Israel’s 10-month partial freeze of new settlement building on occupied Palestinian territory, as announced by Prime Minister Benyamin Netanyahu on 25 November, has been rejected by the Palestinians as a basis for peace negotiations. They want a total freeze. This is the stated position of Mahmud Abbas, President of the Palestinian Authority, and of his chief negotiator, Saeb Erekat. It must be hoped that this is not their last word. At this particular moment in international affairs, is this a sound tactical position to adopt? The question must be posed whether, by rejecting talks on the basis of Netanyahu’s partial freeze, the Palestinians might not be in danger of missing an important opportunity. If, however, the Palestinians hold to their present position, they will undoubtedly be blamed for blocking a resumption of final status talks. They also risk losing invaluable American and international goodwill. In ten months’ time, Israel will feel free to resume full-scale construction, claiming that it has no partner for peace. In the circumstances, the Palestinians might be wiser to call Netanyahu’s bluff and announce their readiness to enter into negotiations at once, as the Obama administration is urging them to do. Netanyahu’s partial freeze is, of course, only a temporary suspension of new construction on the West Bank. Building will proceed on some 3,000 housing units, whose foundations have already been laid. Excluded from the freeze are public buildings within existing settlements, such as schools and synagogues, as well as the Separation Wall and other security structures. Arab East Jerusalem is excluded altogether. Settlement building there is proceeding apace. No objective observer can claim that Netanyahu’s partial freeze is anything but a cynical manoeuvre. It positively stinks of bad faith. It is aimed at easing American pressure on his government and at keeping his governing coalition intact — and it appears to have been successful on both counts, at least temporarily. The United States has welcomed Netanyahu’s decision as a move in the right direction while, at home, no far-right faction has defected from his government, although he has faced some predictable howls of protest from diehard settlers. “We believe that through good-faith negotiations, the parties can mutually agree on an outcome which ends the conflict and reconciles the Palestinian goal of an independent and viable state, based on the 1967 lines, with agreed swaps, and the Israeli goal of a Jewish state with secure and recognised borders that reflect subsequent developments and meet Israeli security requirements. The Palestinians should take heart from these statements. They should heed Mitchell’s words when he says that America’s goal is to re-launch negotiations on permanent status issues as soon as possible, beginning, he suggested, with a resolution of the issue of borders. Mitchell spelled out that the United States has in mind multi-track negotiations: high-level direct talks between the parties; parallel talks with the U.S. about key issues; and lower-level direct talks to work out details. The Palestinians should not remain passive. They should make the most of the emergence of Obama — an extraordinary phenomenon in American politics which is unlikely to recur anytime soon. They should grasp the U.S. initiative with both hands. At the same time, they should seek the active backing of the entire Arab world for their negotiations. The Israelis needs to be reminded on a daily basis of the tremendous benefits which would flow to them from the implementation of the Arab Peace Plan, including normalisation with all 22 Arab states. In some significant ways, the log-jam in Israeli-Palestinian relations appears to be thawing. Israel’s Defence Minister Ehud Barak has spoken of the need “to arrive at a process that will yield two states for two people, to bring an end to the conflict, and to establish a Palestinian state without harming our interests.” Statements of this sort suggest that there is some new thinking inside the Israeli cabinet, some realisation that Obama means business. Meanwhile, the Fatah leader Marwan Barghouti may soon be released as part of a prison swap. He is expected to make a bid for Palestinian leadership. The Gaza leader Ismail Haniya has offered to stand down in the interest of inter-Palestinian reconciliation. Hamas has moderated its stance and seems ready to accept a permanent settlement based on the 1967 borders. Although he is challenged by enemies on all fronts, including within his own movement, Mahmud Abbas should conquer his evident depression and act. He should announce that he is ready to start negotiations with Israel immediately, under active American sponsorship. Patrick Seale is a leading British writer on the Middle East, and the author of The Struggle for Syria; also, Asad of Syria: The Struggle for the Middle East; and Abu Nidal: A Gun for Hire. What’s Really Wrong with the Middle East? 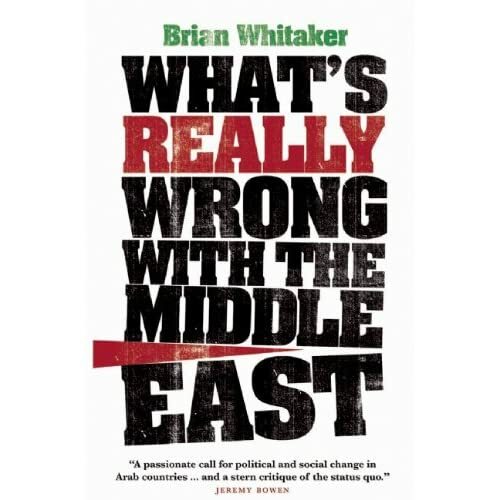 British journalist Brian Whitaker has written a provocative and disturbing book about the Middle East. His title is the one I have put at the head of this article. His book is not kind to the Arabs, since it exposes the profound contradictions and weaknesses in their society. But it should, nevertheless, be translated into Arabic as a matter of urgency and be required reading by Arab elites from the Atlantic to the Gulf. His aim, he says, is to stimulate debate. If the Arab world is to catch up with the rest of the developed world, it would do well to ponder Whitaker’s conclusions and heed his recommendations. Whitaker has travelled widely in Arab countries and was Middle East editor of the Guardian newspaper for seven years. He evidently knows the region intimately. His strength, in researching this book, is that he has not restricted himself, as most journalists do, to seeking the views of political leaders and government officials, but has instead moved outside the strictly political sphere to interview a great many thinkers, academics, students, opinion-formers, bloggers, and ordinary people in many countries across the region. He has looked beyond Arab regimes to society as a whole. That is the originality of his book. The result is a “knowledge deficit,” hampering the development of a well-educated, technically skilled workforce. Whitaker argues that the obsession with kinship in the Arab world undermines the principles of meritocracy and equality of opportunity. Nepotism hampers economic development and places Arab countries at a disadvantage in relation to those parts of the world where such practices are less prevalent. His conclusion is that “Arabs cannot emerge into a new era of freedom, citizenship and good governance while their society continues to be dominated by the obligations of kinship, whether at a family or tribal level…” This, he affirms, is the central challenge the Arabs face today. Another of Whitaker’s provocative chapters deals with the relationship between citizens and their governments. The typical Arab regime, he declares, is both authoritarian and autocratic — authoritarian because it demands obedience and autocratic because power is highly centralised and concentrated around the head of state. One of Whitaker’s most controversial chapters is entitled “The politics of God,” and deals with the tide of religious fervour that has swept across the Middle East during the last thirty or forty years. Religion, he argues, is one response to what has become known as the “Arab malaise.” For millions of believers, religion provides a comfort zone of certainty and hope in a world of doubt and despair. He quotes his sources as suggesting that the lurch towards religion began with the Arabs overwhelming defeat at the hands of Israel in 1967. But further impetus to the trend was given by the success of the mujahideen in driving out Soviet forces from Afghanistan, and by the success of Hizbullah in driving Israel out of Lebanon in 2000 after 22 years of occupation. The idea took root that military success was achievable when inspired by religion. Religion, Whitaker notes, provides a sense of identity, of belonging and of solidarity in the face of threats from outside. But he warns that treating religion as a badge of identity can lead to a heightened emphasis on its outward, physical aspects at the expense of spirituality and ethics. Moreover, as the religious tide swept across the Middle East, more extreme versions of Islam gained in prominence, more rigid in their interpretations of scripture and less tolerant of alternative views. This has sometimes bred growing intolerance, and even acts of violence like the occasion when, in 1994, the 82-year old Egyptian man of letters, Naguib Mahfouz, was stabbed in the neck outside his house. He survived, but his right arm was partly paralysed. Equal rights, Whitaker argues, cannot exist without freedom of religion. In the Arab countries, this is probably the biggest single obstacle to positive change. In his view, freedom of religion requires a state which is religiously neutral. Separation of religion and state is therefore essential, he believes, to any serious agenda for reform. Whitaker’s book contains a lively discussion of corruption and illegal commissions in Arab society, as well as the phenomenon of wasta, that is to say the use of connections, influence or favouritism. There is also a long and well-informed section on the Arabic media, which is too rich to be summarised in a line or two. Whitaker wants the Arabs to break free from a culture of dependence and helplessness and for westerners, in turn, to break free from their history of colonial rule and military intervention, so that both sides can set their relationship on a productive footing of inter-dependence. This book will anger some and excite others. It is one of the most ambitious attempts in recent years by a western writer to analyse what is really wrong with the Middle East. “… Chalabi, who cultivated neoconservatives and the George W. Bush administration when he was an exile drumming up support against Saddam Hussein, told The Washington Times that he is a big fan of Mr. Obama. “……. Israelis know better than anyone else that the trick to developing a nuclear weapon as a small power is to drag out the process of diplomacy and inspections long enough to produce sufficient quantities of fissionable material. Israel should know: in the 1960s, it deliberately misled U.S. inspectors and repeatedly delayed site visits, providing the time to construct its Dimona reactor and reprocess enough plutonium to build a bomb. North Korea has followed a similar path, with similar results. And now, Israel suspects, Iran is doing the same, only with highly enriched uranium instead of plutonium…. I think that Khouri is right on point–as usual. Let’s just be honest: When Western think tanks say “Middle East democracy,” what they really mean is “free Middle Eastern markets.” And, if you can buy a kingdom with your influence–say the Hashimite one?–it is better because you not only have the first objective, but you have an authoritarian security apparatus to secure it as well. “Jordan is a model that works, whether we like it or not,” — not sure what ‘works’ means in this case. If I had to choose between dictatorships (I know that’s pretty sad) I would rather have a pro-Syrian dictator as a apposed to a pro-American-Israeli dictator/monarch like the Jordanian monarch. If the US were to support the Syrian dictatorship it would all of the sudden ‘work’, because of the PR and marketing of the Syrian-American relationship. The “Arab Human Development Report” unfortunately was heavily edited to make sure that the Arab authoritarian regimes don’t really get blamed for any of the problems. Also it made sure that violence by America and Israel are somehow not relevant. The continued colonization of Arab lands is somehow not relevant. So blame it all on the people, the culture, the society, the religion, and then the governments are off the hook and so are their puppet-masters. How convenient. We Arabs don’t need freedom of religion we need freedom *from* religion. That’s far more important. Who would be naive enough to think that the West technologically and socially developed because of freedom of religion. It was freedom from religion, after they raped and pillaged the planet in the name of Christianity, that they “developed”. I would recommend that people read Et Tu Brian Whitaker? You are so right !. Where has Mr. Seale been! Mahmud Abbas’ term ended in January of 2009 and he is no longer an elected nor legitimate representative of the PA or the Palestinians, especially after it was revealed that he supported Israel’s aggression on Palestinians in Gaza and then attempted to block the UN’s report on Israel’s war crimes. So Mr. Seale is asking an Israeli supported Arab despot to negotiate with the Israeli Zionist regime! Truly pathetic. I understand your frustration and i even think that no peace will come out of negotiation with Israel , but i agree with MR Seale , that the Palestinian should negotiate and prepare for the alternative and that is force , no Palestinian should be naive that Israel is going to give the Palestinians their land and state if it is not forced to do so , but for the EU and the US to force Israel to move forward the Palestinians have to be participating , if nothing comes out of the negotiation in the next 11 months , then force and all means necessary should be used . The Hariri affair in the Syrian justice system just before Hariri junior visits Damascus. Jamil Seyyed is now suing in the Syrian Justice the false witnesses (5 of them of Syrian nationality) in relation to the Hariri affair. His request for proper justice after 4 years of illegal detention have been rejected by the TSL and the Lebanese justice system. The Syrian tribunal will request several high profile lebanese personalities, ex ministers etc… as well and Detlev Mehlis to present themselves to this tribunal to be heard. Le Tribunal spécial pour le Liban lui a fermé ses portes pour cause d’incompétence à juger les faux témoins et la justice libanaise refuse de donner suite à ses plaintes répétées : qu’à cela ne tienne, l’ancien directeur général de la Sûreté générale, Jamil Sayyed, s’adresse à la justice syrienne et obtient, au moins à cette étape du parcours, gain de cause. Dans un timing qui ne peut pas être innocent à la veille de la visite prévue du Premier ministre Saad Hariri à Damas et alors que le procureur général du TSL, Daniel Bellemare, est encore au Liban, le général Sayyed a annoncé hier que la justice syrienne a émis des mandats d’arrêt contre « les faux témoins et leurs complices » portant la nationalité syrienne et elle a délivré des commissions rogatoires pour entendre « leurs nombreux complices présumés libanais et étrangers, dont le député Marwan Hamadé, le conseiller en information du Premier ministre Hani Hammoud, le directeur général des FSI Achraf Rifi, le procureur général Saïd Mirza et d’autres politiciens et journalistes ». Dans les détails de l’information, les avocats de Sayyed en Syrie lui ont annoncé que le magistrat syrien chargé de statuer sur la plainte qu’il a déposée contre les faux témoins et leurs complices, dans l’affaire de l’assassinat du Premier ministre Rafic Hariri, a émis des mandats d’arrêt contre l’ancien vice-président syrien Abdel-Halim Khaddam et contre Mohammad Zouhair Siddiq. Le juge syrien a aussi délivré des commissions rogatoires pour informer les personnes de nationalité libanaise et autres, dont le nom figure dans la plainte, de la nécessité de se présenter devant la justice syrienne pour être entendues. Toujours selon le général Sayyed, ces commissions rogatoires ont été communiquées à la justice libanaise au cours de la semaine dernière. Elles comportent les noms des anciens ministres Marwan Hamadé, Hassan Sabeh et Charles Rizk et l’ancien député Élias Atallah. Les noms des magistrats Saïd Mirza, Sakr Sakr et Élias Eid figurent aussi sur la liste aux côtés de ceux du général Achraf Rifi, de Wissam Hassan, Samir Chéhadé, Houssam Tannoukhi et Khaled Hammoud. De même, les journalistes Farès Kachan, Hani Hammoud, Hassan Sabra et d’autres sont aussi convoqués devant la justice syrienne, en plus de l’ancien chef des SR Johnny Abdo, du jounaliste koweïtien Ahmad Jarallah, propriétaire du quotidien as-Siassa, et de l’ancien président de la commission d’enquête internationale Detlev Mehlis et son adjoint Gerhard Lehmann. Le journaliste syrien résidant au Liban, Nohad al-Ghadri, et les faux témoins syiens installés au Liban, Akram Chakib Mrad et Ibrahim Michel Jarjoura (ce dernier a été interdit de quitter le territoire libanais sur décision personnelle du juge Mirza, contrairement à la loi, selon le bureau d’informations du général Sayyed) font aussi l’objet de commissions rogatoires, ainsi que le « faux témoin » israélien d’origine palestinienne, Abdel Basset Bani Aoudeh, installé en Suède. The EU and US are on Israel’s side and feign care for one non-Jewish person here and there but they really don’t care. There is no more room for negotiations. We will eliminate Zionism, no not Jews, and create one state that is democratic and secular. We will not negotiate with an apartheid regime. We cannot and shall not appease Zionists. Then it is time for deeds not talks , show me ,!. This is where association and causation got mixed up in the mixed up in the mind of Mr. Brian Whitaker. Yes the Arab world is authoritarian, lacks democracy, and in large repressive socially and politically, but I disagree that these are the main causes for the paucity of scientific innovation, and certainly has nothing to do with the economic condition of most Arab states. It is very easy to argue the economic point, just look at Singapore, China, and many Asian tigers to see how authoritative states do not hinder economic development, and look at Japan as an example of socially repressive state where innovation is the hallmark of economic prosperity. The reason the Arab world lags many other regions is because its political class is mostly under-educated and less sophisticated than the rest of the world. There is absence of an educated highly skilled technocratic class that is able to govern effectively in the majority of the Arab world (an notable exception is the economic team in Lebanon and the results are obvious). Things are changing though a great example is the transformation in Syria today, and I would expect that within the next 10 years Syria will demonstrate significant improvements in all areas as the President has focused his energy on developing such class. These changes have already shown significant results, (I think Syria has passed more legislations and changed more laws in the past 7-8 years that it did in the previous 40 years). This trend will escalate especially if the Baath party steps away from governance to what they are now considering, a leadership position, laying out the broad directions for the country, but allowing the skilled technocrat to govern. 1) You can’t leave Saudi Arabia out despite all the that is troubling in the Wahabi Kingdom. Saudi Arabia will count on Egypt to prevent the Fourth Territory’s alliance from successfully leading change and reforms in the region. 2) Syria and Iraq were never allowed to be allies. They were allies for few months in 1978 I believe when Hafez Assad needed the support of Iraq’s President at the time, Ahmed Hassan al-Bakr, to help stop Sadat’s Camp David accord from being adopted by the Arab world. They succeeded in doing so but Saddam quickly removed Al-Bakr and relations with Syria deteriorated ever since. Syria and Iraq have never been allowed to become close allies in the 20th century. 3) this alliance will be independent from the wishes of the United States and Europe … it will be very friendly and very constructive, but independent. Is the United States ever going to accept dealing with non-puppets? 4) Iran needs to demonstrate its ability to act as a relatively moderate Islamic state. For the past few years President Ahmedinejad positioned his country as a highly independent, but seemingly aggressive one. For the United States to lend its support to the Forth Territory Alliance, Iran needs to change in advance. For Iran to change, Israel needs to change … Iran’s hostile arrogance is a reflection of Israel’s exceptional hostility and arrogance. So … Israel and the United States can help fight extremism in the region. But Israel won’t do that … it will lose its special status that it enjoys today. Conflict (controlled though) is good for Israel. Wikipedia tells: A popular joke in the IDF says that “Magach” [upgraded M-60] means “Movil Gviyot Charukhot”—”charred bodies carrier”, probably referring to the Yom Kippur War losses and particularly to the aforementioned flammable hydraulic fluid problem of the M48. But on a serious note, it’s strange this whole “deal” with the old tanks. Why on earth would Turkey purchase refurbished old hardware from Israel, when its aim is to modernize its military? I would guess that Turkey’s military alliance with Israel (whatever existed or is left of it) was much more strategically-oriented, perhaps to counter a possible Iranian threat (future, real or perceived). Otherwise, Turkey really doesn’t “need” Israel. Israel, however, very much needs Turkey. I agree with most of what Brian Whitaker wrote in his book about our backward society, dictatorship governments and our lack of education,I also agree with Ugarit, the need to be free ‘from’ religion note. Please check out this very disturbing piece of news and how few conservative lunatics are dictating what should and shouldn’t our best artists express their art..how ugly is that when few uneducated people have influence on the whole society. Just turn Syria into Afghanistan and done with it, it’s better than doing this nonsense issues every day, at least we know that Syria is Afghanistan and we forget any hope of going forward, not that our hopes are really high but at list they still exist. اما الناقد التشكيلي سعد القاسم فقال “انه نوع من الرقابة الاجتماعية تتعلق برؤية الناس للعمل الفني التي لا تميز بين ما هو جمالي وابداعي، وما يثير الغرائز”. وردا على سؤال عن الموقف الرسمي الحكومي ازاء هذه “الرقابة الناشطة”، قال ان “مديرية الفنون الجميلة تأخذ علما بالمعارض من أجل التنسيق بينها لكن يصعب التدخل بقرارات من هذا النوع”. واكد القاسم “قبل ان يحدث ذلك في الفن التشكيلي حدث على مستوى الاعلانات التجارية حيث رفض معلنون ان تظهر المرأة في اعلاناتهم من دون غطاء للرأس”. Oh dear. I’m inclined to agree with Assad Abu Khalil: Whittaker has been one of the best English speaking journalists to work in the ME over the past years, but he has shown disturbing signs of leaning towards glib orientalist cliches in latter years. Take the above quote: Whittaker seems to forget that most non-Western socities place great value on conformity. China and Japan certainly do, and it hasn’t prevented them from having extremely succesful civilizations lasting several millenia. Even within Western Culture, the Anglo-Saxon model of extreme individualism is the exception, not the norm. The Scandinavian countries, for example, place a lot of emphasis on conformity (or ‘consensus’ if you prefer) yet that hasn’t stopped them punching well above their weight in so many fields. now, one cannot deny that the Arab world has serious problems on so many levels. But if this review is accurate, Whittaker is simply repeddling the old cliches of the UN Development Report and countless hand wringing hacks. That would be a shame if it is true, because I have long admired his work.